John McGlynn has told his players to ‘man up’ after watching them lose two games from winning positions in recent weeks. Defeats at Forfar and East Fife have damaged the club’s title hopes and left them trailing league leaders Arbroath by 10 points. With 23 games still to play, there is hope that the deficit can still be overturned, but McGlynn insists his players must learn the lesson of competing for a full 90 minutes. “Twice in the last three weeks we’ve been in a winning position at half-time, and for whatever reason, we’ve not played at the same level in the second half,” McGlynn said. “It’s cost us six points – which is massive. “On Saturday we didn’t compete as well in the second half as we did in the first. “We went through the pain of the video analysis, and we discussed it at length, but we told them that talk is cheap, and that actions speak louder than words. “We have talented players – we can play the best football in this league and I’ve no doubt about that – but in this league it’s not all about nice silky soccer. “There are teams that are street-wise, experienced, and they know how to win games. “So we need to be able to match that, and let the quality of our football take over to win matches. “But to do that we need to grow up. We need to man up and when the going gets tough, we need to be prepared to stand up and be counted. “At the moment we don’t have every person doing that, and it’s more a character thing than anything else. “I know it would be very easy to judge that we are full-time, our opponents are part-time, and we should beat them, and I think the same. Raith are not being helped by an extensive injury list, with Lewis Vaughan now set to miss the next six to eight weeks after undergoing groin surgery on Tuesday. Chris Duggan, Grant Gillespie and Regan Hendry remain sidelined, while Iain Davidson and Euan Murray are both hoping to be fit for Saturday’s trip to bottom of the table Stenhousemuir after picking up knocks at Bayview. With Nat Wedderburn also suspended for Ochilview after accumulating six bookings, McGlynn will once again be faced with selection problems, although Lewis Milne is expected to return after missing the East Fife game with a sickness bug. 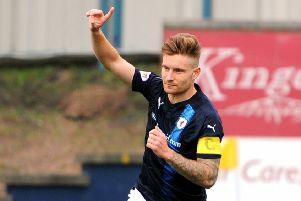 “I’m getting a bit fed up talking about it (injuries), because as you saw in the first half on Saturday, we had 11 players on the park capable of winning the football match,” McGlynn said. “We had the game won, and we blew it. “We’ve not had our strongest team out yet, we’re hoping that’s going to come. McGlynn was still waiting to hear whether he would receive a touchline ban after being sent to the stand in Saturday’s Fife derby, which will be decided by the SFA’s compliance officer based on referee David Munro’s report of the incident. “I’ve only been stand to the stand three times and I honestly believe on each occasion it’s became a mountain out of a molehill. “Yes, I was annoyed, but you can look at the inexperience of the officials, and the way they handled the situation.